Access to high quality abortion care is essential to women’s health, as evidenced by the dramatic decrease in pregnancy-related morbidity and mortality since the legalization of abortion in the United States, and by high rates of maternal death and complications in those countries where abortion is still provided under unsafe conditions. The past two decades have brought important advances in abortion care as well as increasing cross-disciplinary use of abortion technologies in women’s health care. Abortion is an important option for pregnant women who have serious medical conditions or fetal abnormalities, and fetal reduction techniques are now well-integrated into infertility treatment to reduce the risks of multiple pregnancies resulting from assisted reproductive technologies. 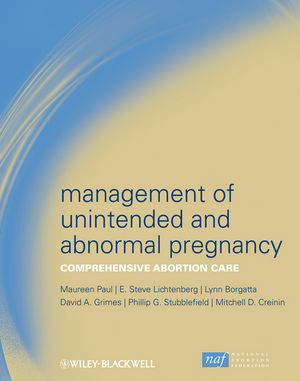 Management of Unintended and Abnormal Pregnancy: Comprehensive Abortion Care is the textbook of the National Abortion Federation, and serves as the standard, evidence-based reference text in abortion care. This state-of-the-art textbook provides a comprehensive overview of the public health implications of unsafe abortion and reviews the best surgical and medical practices for pregnancy termination, as well as managing ectopic and other abnormal pregnancies. provides resources for clinical, scientific, and social support for the abortion provider and patient. Section I Abortion in perspective. 1 Abortion and medicine: A sociopolitical history (Carole Joffe PhD). 4 Abortion law and policy in the USA (Bonnie Scott Jones JD, and Jennifer Dalven JD). 6 Clinical assessment and ultrasound in early pregnancy (Steven R. Goldstein MD, and Matthew F. Reeves MD, MPH). 7 Medical evaluation and management (Anne Davis MD, MPH, and Thomas Easterling MD). 8 Pain management (Mark Nichols MD, Glenna Halvorson-Boyd PhD, RN, Robert Goldstein MD, Clifford Gevirtz MD, MPH and David Healow MD). Section III Abortion methods and techniques. 9 Medical abortion in early pregnancy (Mitchell D. Creinin MD, and Kristina Gemzell Danielsson MD, PhD). 10 First-trimester aspiration abortion (Karen Meckstroth MD, MPH, and Maureen Paul MD, MPH). 11 Dilation and evacuation (Cassing Hammond MD, and Stephen Chasen MD). 12 Medical methods to induce abortion in the second trimester (Nathalie Kapp MD, MPH, and Helena von Hertzen MD, DDS). 13 The challenging abortion (Lynn Borgatta MD, MPH, and Phillip G. Stubblefield MD). 14 Contraception and surgical abortion aftercare (Eve Espey MD, MPH, and Laura MacIsaac MD, MPH). 15 Surgical complications: Prevention and management (E. Steve Lichtenberg MD, MPH, and David A. Grimes MD). 16 Answering questions about long-term outcomes (Carol J. Rowland Hogue PhD, MPH, Lori A. Boardman MD, and Nada Stotland MD, MSc, MPH). Section V Management of abnormal pregnancies. 17 Pregnancy loss (Alisa B. Goldberg MD, MPH, Daniela Carusi MD, MSc, and Carolyn Westhoff MD). 18 Ectopic pregnancy (Jennifer L. Kulp MD, and Kurt T. Barnhart MD, MSCE). 19 Gestational trophoblastic disease (Neil J. Sebire MD, and Michael J. Seckl MD, PhD). 20 Abortion for fetal abnormalities or maternal conditions (Jeffrey S. Dungan MD, and Lee P. Shulman MD). 21 Multifetal pregnancy reduction and selective termination (Mark I. Evans MD, and David W. Britt PhD). Section VI Abortion service delivery. 22 Providing abortion in low-resource settings (Laura Castleman MD, MPH, MBA, Beverly Winikoff MD, MPH, and Paul Blumenthal MD, MPH). 23 Ensuring quality care in abortion services (Beth Kruse MS, CNM, ARNP, and Carla Eckhardt CPHQ). Appendix: Resources for abortion providers (Melissa Werner MPH, MAT).